The location of the 230-km diameter Lyot crater in the northern highlands of Mars is indicated (by the dotted-line box) in this topographic view of the planet. This crater is one of several which have been found to exhibit spectral signatures of hydrated minerals - for further details, see Carter et al., (2010). The Lyot crater was formed during the Early Amazonian period and is the largest and deepest crater in the northern plain. 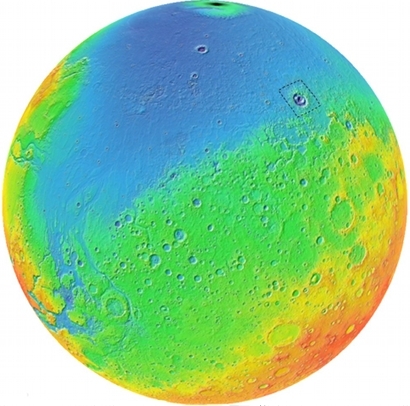 This topographic map of Mars, derived from Mars Orbiter Laser Altimeter (MOLA) observations, clearly shows the Martian dichotomy - the distinctive boundary between the northern (lowland) and southern (highland) regions.